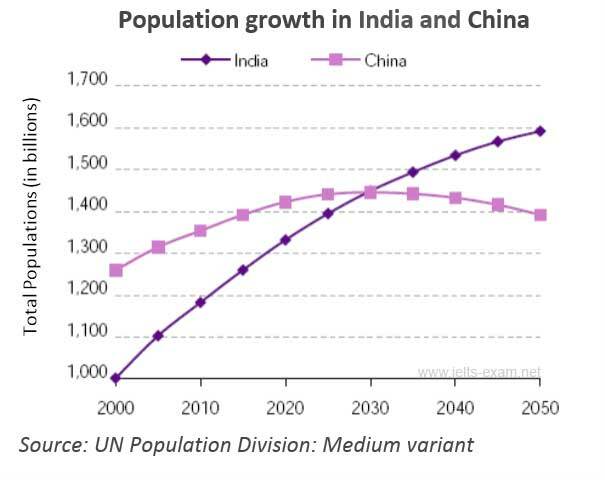 The table, graph or bar chart below shows population figures for India and China since the year 2000 and predicted population growth up until 2050. The line graph demonstrates population figures for India and China since the year 2000 and predicted population growth up until 2050. The vertical axis indicates the total populations (in billions) and the horizontal axis shows the period between 2000 and 2050. From 2000 to 2025, there was a gradual rise in both countries’ population and eventually, in 2030, the population of both countries was the same with the population of over one billion and four hundred million. There was an insignificant decline in the population of China from 2030 to 2050, however, at the same period of time, there was a considerable increase in the population of India from over one billion and four hundred million to one billion and six hundred million. To conclude, the line graph illustrates that there has been an upward trend for the population of India in this period of time and it will be increased slowly in the future. On the other hand, the population of China will be decreased moderately after this period. It’s better to use ‘population’ in a singular form. You don’t need to refer to the vertical or horizontal axes of the line graph. Instead, you should interpret the graph. The most important factor in this task is to be able to interpret the data. You have not provided an accurate account of the visualized data. There has been a sharp / steady increase in India’s population from 2000 to 2050, while China’s population has undergone some fluctuation. China’s population seems to adopt a descending trend in the future; accordingly, we can conclude that this country has been more successful in controlling overpopulation issues. Reasoning: You should also develop some implicit reasoning, i.e. making inferences. 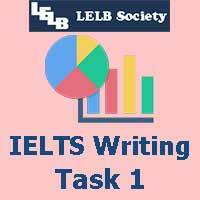 Study the growing archive of IELTS Writing Task 1 Samples.